In my own experience, I have used them in a very limited context until recently. My use case involved sending tasks to the main/ui thread, primarily to update the UI from any other thread. The other aspects of the multi-threaded operation were handled through alternate ways like ThreadPoolExecutor, IntentService, and AsyncTask. MultiThreading and task running are old subjects. Java itself has java.util.concurrent package and Fork/Join framework to facilitate it. Several libraries have been written to streamline asynchronous operations. RxJava is the most popular library today for reactive programming and designing an asynchronous application. So, why am I writing about the old school? Looper, Handler, and HandlerThread are the Android’s way of solving the problems of asynchronous programming. They are not old school, but a neat structure on which a complex android framework is built. For new developers, it’s highly recommended to understand the principles behind them and experienced one’s should revisit this topic to recollect the minor details. I have also created a video tutorial for this subject, and I highly recommend to watch it. Click here to watch now. The main thread in Android is built with a Looper and Handlers. So, the understanding of it is essential to create an unblocked responsive UI. The developers writing libraries cannot afford to use third party libraries because of the library size. So, for them, the best option is to utilize the existing available resource. Writing own solution for it may not always get that level of efficiency and optimization. The same argument can also be made for companies/individuals shipping out SDKs. The clients can have varied implementations, but all of them will share the common android framework APIs. Understanding them fully will enhance the capacity to follow the Android SDK and package classes in general. Let’s start the exploration/revision with a questionnaire. I expect the reader to have the basic understanding of java threads. If you need, then get a quick overview of java Thread and Runnable. What is the problem with java thread? Java threads are one-time use only and die after executing its run method. The Thread is a double edged sword. We can speed up the execution by distributing the tasks among threads of execution, but can also slow it down when threads are in excess. Thread creation in itself is an overhead. So, the best option is to have an optimum number of threads and reuse them for tasks execution. The thread is kept alive, in a loop via it’s run() method. The task is executed serially by that thread and is maintained in a queue (MessageQueue). The thread must be terminated when done. What is the Android’s way of doing it? The above model is implemented in the Android via Looper, Handler, and HandlerThread. The System can be visualized to be a vehicle as in the article’s cover. MessageQueue is a queue that has tasks called messages which should be processed. 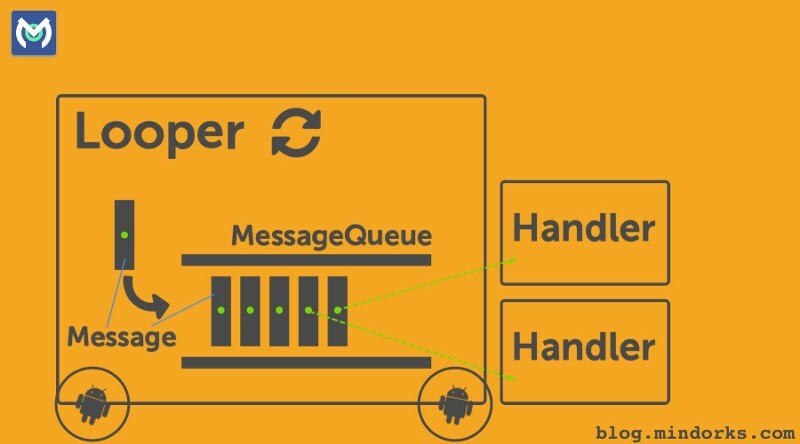 Handler enqueues task in the MessageQueue using Looper and also executes them when the task comes out of the MessageQueue. Looper is a worker that keeps a thread alive, loops through MessageQueue and sends messages to the corresponding handler to process. Finally Thread gets terminated by calling Looper’s quit() method. One thread can have only one unique Looper and can have many unique Handlers associated with it. A thread gets a Looper and MessageQueue by calling Looper.prepare() after its running. Looper.prepare() identifies the calling thread, creates a Looper and MessageQueue object and associate the thread with them in ThreadLocal storage class. Looper.loop()must be called to start the associated looper. Similarly, the looper must be terminated explicitly through looper.quit(). A Handler gets implicitly associated with the thread that instantiates it via thread’s Looper, but we can explicitly tie it to a thread by passing the thread’s looper in the constructor of the Handler. Message: It is a class that defines various useful methods to deal with message data. To send an object we set the obj variable. 2. Runnable: A runnable can also be posted in the MessageQueue. Ex: posting and running a task in the main thread. In the above example, we create a Handler and provide Looper associated with the main thread. This associate this handler to the main thread. When we post the Runnable, it gets queued in the main thread’s MessageQueue and then executed in the main thread. Creating an own thread and providing Lopper and MessageQueue is not the right way to deal with the problem. So, Android has provided HandlerThread(subclass of Thread) to streamline the process. Internally it does the same things that we have done but in a robust way. So, always use HandlerThread. One of the ways to create the HandlerThread is to subclass it and most of the time you will be using this method. Note: We have instantiated the Handler when the onLooperPrepared() is called. So, that Handler can be associated with that Looper. Looper is only prepared after HandlerThread’s start() is called i.e. after the thread is running. A Handler can be associated with a HandlerThread, only after it’s Looper is prepared. Note: HandlerThread needs to call myHandlerThread.quit() to free the resources and stop the execution of the thread. I would suggest practicing the above codes, so you can grasp their little details. I have created an example project for Post Office simulation. Post Office is built upon HandlerThread and Clients communicate with the help of the Post Office. A Simulator class creates few Client Bots and delegate their communication to the MainActivity, which renders it in a live feed.